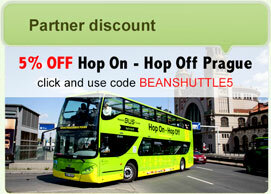 Boarding a Bean Shuttle van is just one click away. Fill out the booking form on top of the page and wait for confirmation. In Cesky Krumlov, we'll pick you up and drop off at your hotel or pension. In the big cities we've found the most convenient pick-up and drop-off spots right on the hubs of local public transport, intercity train terminals and airports.You do not need to wait for last-minute deals anymore, we are cheaper right now. You do not need to wait for last-minute deals anymore, we are cheaper right now.